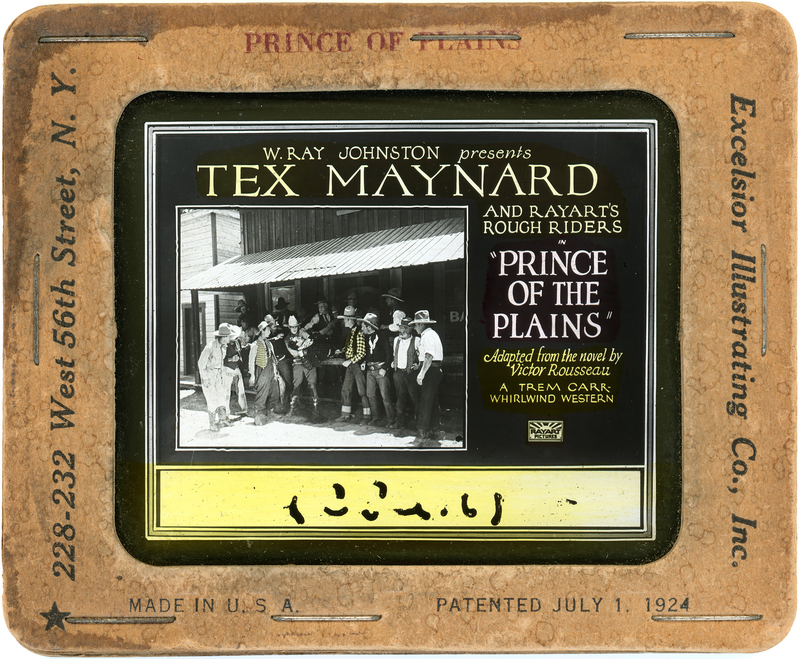 SCVHistory.com LW3126 | Film-Arts | Lantern Slide: Kermit Maynard in 'Prince of the Plains,' Trem Carr 1927. Kermit Maynard in "Prince of the Plains"
Magic lantern slide advertising "Prince of the Plains" starring Kermit Maynard (as "Tex" Maynard), Trem Carr Productions 1927. The lantern slide was issued by Excelsior Illustrating Co. Inc. of New York, patented July 1, 1924. "Prince of the Plains" was probably shot in Placerita Canyon. The film no longer exists, so we can't be certain, but Carr was already making movies in Placerita Canyon the year before, both on his own and in partnership with others. "Prince of the Plains" was released in September 1927, Carr's second year of eponymous production. He did not yet own his own movie ranch. Kermit Maynard (1897-1971) was the stuntman brother of Western actor Ken Maynard. This 5-reeler also starred Betty Caldwell and Walter Shumway. Produced by Robin Williamson; screenplay by Arthur Hoerl from the novel by Victor Rousseau; cinematography by Hal Depew. Trem Carr quit the construction trade in Illinois in 1922 and came out West to make movies. By 1926 he was doing just that in Placerita Canyon under his own name, Trem Carr Productions. 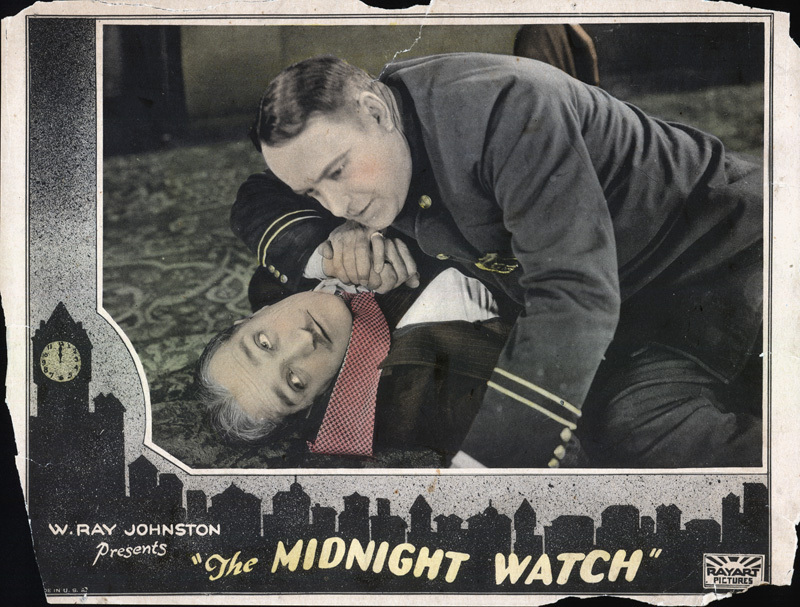 In 1928 he teamed up with W. Ray Johnston to form the production company Syndicate Pictures Corp. In 1931, Carr and Johnston reorganized Syndicate into the first iteration of Monogram Pictures Corp., with Johnston as president and Carr in charge of production. That same year, Carr leased property in Placerita Canyon which would eventually become part of Walt Disney's Golden Oak Ranch. In 1936, when Carr's lease was up, he moved his Western movie town down Placerita Canyon Road to property purchased for that purpose by set designer Ernie Hickson, another 1922 arrival. Hickson's Placeritos Ranch was renamed Melody Ranch when Gene Autry bought it following Hickson's death. Johnston, incidentally, lived in Newhall part-time in the 1940s, in a Charley Mack house on 8th Street. LW3126: 9600 dpi jpeg from original lantern slide purchased 2016 by Leon Worden.